Brenda came home yesterday with a sack of big, luscious cherries. These three survived just long enough to be painted. They were really tasty. They look as good as the painting. Love these cherries. Great color. Simple but beautiful. Cherries are my favorite fruit!These are glorious.Beautiful painting. Thanks, Tanner!--nice to hear from you. I thought I ate all the cherries on the planet this summer. Guess I missed these three. Glad I did so you could preserve them so well. Thanks, Sam. 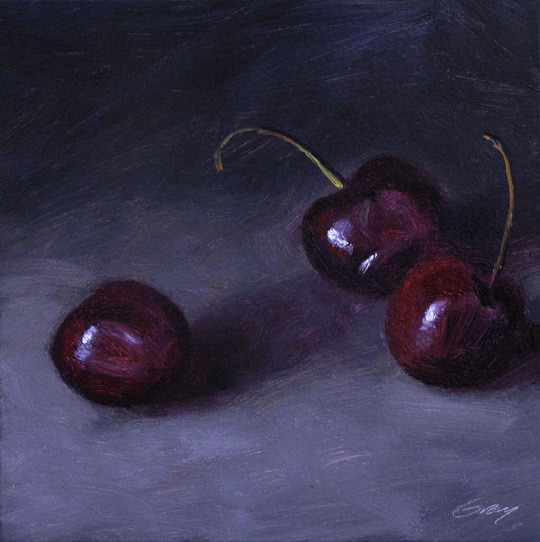 I considered painting these cherries from memory. I could rationalize it by what Picasso said: "First you eat the apple, then you paint it."